Strauss’s 1924 opera was based on an incident in his own life, when a note with amorous implications mistakenly addressed to him by a woman he’d never met caused his hot-tempered wife to threaten divorce. 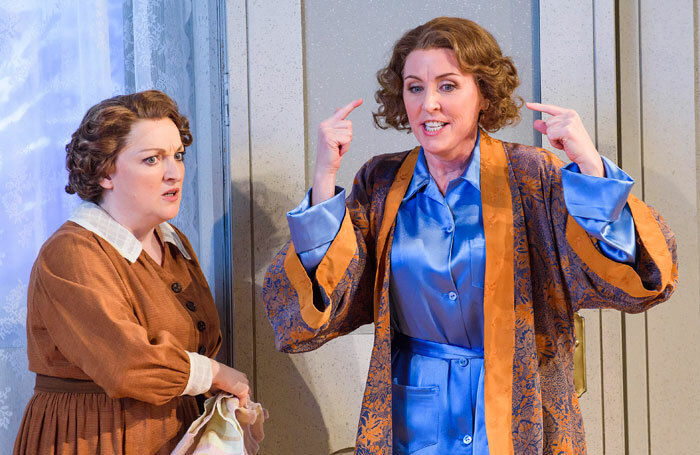 The result is a wordy but genuinely funny domestic comedy, and Garsington are quite right to play the piece in English, in an excellent translation by the late Andrew Porter. Strauss – or rather his fictionalised representative, the composer and conductor Robert Storch – being away from home when this marital blow-up occurs, the main thrust of the evening falls on Mary Dunleavy, who sings the role of Christine Storch (alias – in real life – Pauline Strauss). The US soprano may lack the creamy tone Strauss’s writing ideally requires, but she presents the obstreperous, touchy woman with unerring skill, and never tires throughout what is for her, at least, a long and extremely demanding evening. Mark Stone sings the role of the much put-upon composer himself, singing with resilience and handsome tone, and offering a matinee-idol view of the character – all charm and long-suffering patience. Sam Furness is ideal as Baron Lummer, the on-the-make young man Christine comes close to falling for while her husband is away. Ailish Tynan makes a meal of the Storchs’ harassed maid, Anna, while young Louis Hynes is deeply touching as their son Franzl, in what is – astonishingly, given his assurance – his first stage role. Bruno Ravella’s staging is neat and effective, the many swift scene changes accomplished with considerable dexterity. These are made possible by Giles Cadle’s ingenious, realistic sets, which define each of the numerous settings perfectly. To accompany these scene changes Strauss produces a series of varied and brilliant orchestral interludes – the meat of the score – which are superbly handled by the Garsington Opera Orchestra under the focused baton of Jac van Steen.